WhatsApp and Viber are two of the finest and incredibly popular apps out there for Android. WhatsApp is my preferred way of keeping in touch with friends and family. Viber is not so far behind either. Since video and voice call features are also available in Viber, it's a more complete package. Very recently, Viber team had made their desktop plans very clear and Windows and Mac version were released soon enough. Now its Linux's turn, though Viber for Linux is available in 64 bit binaries only at the moment. 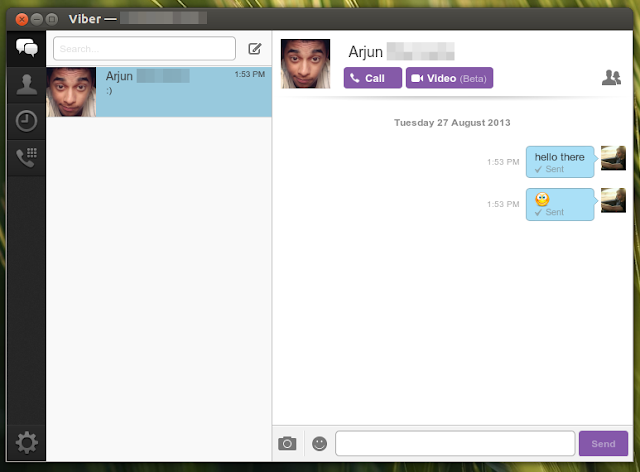 Viber for Linux Beta Released! If you have Viber installed in your smartphone already, then things are pretty easy. Just enter your mobile number into the Viber for Linux app, then it will send an authentication code to your mobile Viber app. And that's it! All you Viber contacts will be in sync automatically. I haven't tested the video and voice call features of Viber for Linux yet, but it seems like video call can be done desktop to desktop only. And the instant messaging part works just fine. Moreover, FOSS Skype alternatives such as TOX is not ready yet, hence Viber is among the few video and voice call apps out there that work on Linux. After the download is complete simply do the following in Terminal. Done. Authenticate your credentials and Viber for Linux is good to go. If you want to contribute, join the Viber beta testers community on Google+.